In its release date, Apple Watch Series 2 seemed to bring a big KO for existing wearable in the market. But, apparently this thing is not really true because this Apple Watch series is only available for iOS, particularly for the iPhone. But the thing is, the number of Android users, especially for Samsung’s Android products, is really high too if we compare it to the number of iOS users. That’s why we need to find another smartwatch product that is sufficient enough as a companion for advance Samsung Android devices. And in this case, we strongly purpose: Samsung Galaxy Gear S3. How smart and sufficient this watch is? Let’s find out in the Samsung Galaxy Gear S3 Specs information below. Shortly speaking, Samsung is not the new player in the Smartwatch game. Since 2013, the South Korean company has been so successful in launching their very first smartwatch product called Samsung Galaxy Gear in an event in Berlin. This is a smartwatch product that was aimed as a companion for Samsung Galaxy smartphone as well as tablet. And on August 2016, the South Korean Electronic Company released their last edition of smart watch called Samsung Galaxy Gear S3. Offered in two types, Classic and Frontier, this smart watch brings a lot of upgrades from the previous series to provide you more delicacy and sophistication. As a comparison, you can read Apple Watch Series 2 review in this link. In the beginning of Samsung Galaxy Gear S3 Specs topic, we’ll talk about its design first. 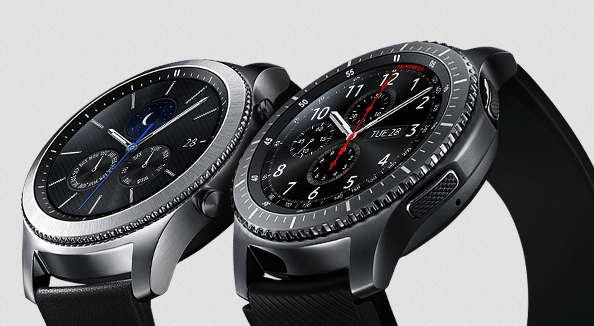 Surely, this is the best-looking watch Samsung has ever made. The solid metal case with elegant leather strap gives you a classy real-watch look. In the display, both Frontier and classic has 1.3 inch round-Super AMOLED display. With 278 ppi and 360 x 360 resolution, this screen will give you brighter and more vivid color than the previous Gear series. Further, the addition of Gorilla Glass SR+ Corning offers more protection from the scratch. About the size, certainly we find that this watch edition is a bit chungky with its 26 x 49 x 12.9mm metal case and 59 grams of weight. However, the design fits perfectly with that dimension, so the chunky feels is not really a problem. Further, this watch is also completed with water and dust-resistance. Yes, it already certified by MIL-STD-810G, make this watch is friendly for outdoor activity lover. And for the strap, you can easily change the strap because this watch can be fitted with any 22 mm standard strap. What impressing so much in the Samsung Galaxy Gear S3 Specs mostly is the processor, RAM, storage, and Operating system. The Processor is dual-core 1GHz Exynos 7270, customly made by Samsung. Paired with the 768MB RAM, the use of this processor impacts on the lighter operation and better graphic. The transition between screens feels so smooth, and the animation is not bed too. Further, with 4GB internal storage, you can save more contacts and data in the watch. For the OS, we all know that Samsung’s smartwatch products mostly use Tizen-based OS, and so with Samsung Galaxy Gear S3. Tizen is a specially-designed OS for smartwatch product. Samsung has come a long way to develop this OS, so no wonder if Tizen here performs amazingly. The UI is really simple, clean, and just fits perfectly with the round screen. You’re not only able to control the watch by touching the screen, but the using rotating screen features also performs as easy as touching the screen. And more importantly, this OS is compatible to both Android 4.4 above and iOS 9.0 ABOVE. Well, we can say Samsung is not being selfish in this case. The Next thing in Samsung Galaxy Gear S3 Specs is the features. As other smartwatch product Samsung Galaxy Gear S3 has heart-rate monitor. You can find the sensor located in the underside of the watch. Moreover, it also has the GPS. Even if the GPS is not working as good as the one in the smartphone, but this features is able to give you precise coordination and route calculation. With this two features, the watch regularly record your routine such as mapping your route, distance, heart rate, and altitude. In some countries edition, LTE feature is available too. Before talking about price, we tell you that as a part of Samsung Galaxy Gear S3 specs, this device has 380 mAh battery capacity. Samsung claims that this battery can keep the device on in 2 days for the regular use. While for the charging system, it comes more sophisticated with wireless charging. So, in conclusion, we think that Samsung has been successful in offering delicate design and sophisticate technology in Samsung Galaxy Gear S3. Apple Watch Series 2. More than that, the availability of this wearable device to be connected to multiple OS is a good point for Samsung. Read another review of this smart watch in here. Last part of Samsung Galaxy Gear S3 specs topic, we will talk about the price of this device. It’s generally known that Samsung is one company that offers their products in competitive price. This is proven in this edition of Galaxy Gear. With such specifications, you can find this device offered in a price that is much more affordable than the Apple Watch. In Amazon, the Gear S3 is offered in 299 USD. While in Indonesia, you can bring it home by paying around 5 millions rupiahs. So, what are you waiting for?